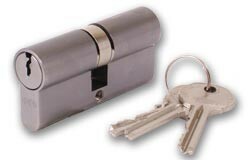 Euro Profile Cylinder locks come with a set of 2 double cylinders and one singular cylinder which are then secured into place to a door. Many of these locks have been proven to be resistant to many different factors that could compromise security. For example, the ASEC Kite B Kite-marked Snap Resistant Euro double cylinder' offers to be snap resistant, drill resistant, pick resistant and bump resistant to ensure maximum security. It has also got a BSI kite-mark which is a recognised guarantee of safety and security.